It’ll be several years before blockchain tech has any significant impact on the loyalty industry. Yes, blockchain has a lot of potential. In fact, it will be transformational. But based on my experience (30 years as a fintech entrepreneur), it’s clear that much of the conversation currently is fuelled by misinformed hype, rather than any genuine understanding of short-term implications or justifiable expectation of near-term success. Blockchains – of which there are many, mostly incompatible with each other – are simply not ready in their present state. They are too slow, expensive at scale, and insufficiently evolved at the application layer (business logic) to be of much use in the loyalty sector until five key roadblocks are overcome. This will happen gradually over the next 2, 3, or 5 years. But while excited boardrooms spend hours brainstorming ways “to do something with blockchain”, companies risk distracting themselves from real, present opportunities to succeed with loyalty in other ways. So primarily for B2C marketers, but also anyone with a professional curiosity in blockchain, I’m setting out the 5 major roadblocks in 2018 that will restrict blockchain as the enabling infrastructure for new loyalty tech until time and investment allows them to be overcome. Click here to skip straight to the roadblocks. First, though, a look beyond most brands’ planning horizons, to exactly how blockchain will benefit the loyalty industry. Why would loyalty marketers even need blockchain? Eventually, blockchain will likely reduce costs in points-based loyalty programs, deliver greater freedoms to customers, and make it easier to run collaborative marketing campaigns with other brands. This is primarily because application layer logic (loyalty rules) can be extracted from legacy loyalty systems and pushed into the blockchain network – where they are easier to modify. For the consumer, this should mean more valuable rewards, and the flexibility to spend loyalty points more easily, in more places. Blockchains can confer this benefit because they are simultaneously a means of securely recording transactions, and of executing them. …and this can all take place almost instantaneously. Currently, such partnerships typically involve an intermediary to process the transaction, and a certain amount of infrastructural development work to allow your own loyalty tech stack to communicate with that of the car rental firm. Inevitably, that means you forge fewer partnerships because they are slow to implement and costly to integrate, leaving less value available to fund rewards for the customer, and less success for your program. In a blockchain alternative, the car rental firm and other industry stakeholders (who are using the same or compatible blockchains) will have teamed up to operate a blockchain optimized for loyalty. This blockchain will be pre-programmed to allow participating brands to define such functionality in Smart Contracts, doing away with the need for an expensive third party. This scenario is, I estimate, around 4-6 years away. More feasibly, in 2-3 years, you and other likeminded, pioneering marketers will persevere with the bulk of your loyalty stack, but use something like a private sidechain to process and record your loyalty currency transactions. Even that will take some doing, with so many roadblocks yet to overcome. A quick note on cryptocurrencies before we proceed. Do not confuse blockchains – a distributed infrastructure for processing transactions in a trustful way – with crypto-currencies (like Bitcoin) which are the digital currency often transacted on a blockchain. There are thousands of crypto-currencies – and defining their characteristics is not the purpose of this article. Some people, however, think that loyalty currencies may become traded as cryptocurrencies; but this does not seem advantageous. Cryptocurrencies (or ICO tokens) are increasingly being regulated as financial instruments by governments around the world. Regulations will differ wildly, and for a global loyalty program operating in dozens of countries, that will mean having to negotiate scores of different regulatory frameworks. We don´t believe most loyalty programs will convert their loyalty points into a crypto-currency for many reasons, but principal among them is that your loyalty program will not want to be regulated as though you were a bank in most countries where you do business. Blockchains don’t yet have the technological capability needed to handle commonplace loyalty requirements beyond basic currency transaction processing. 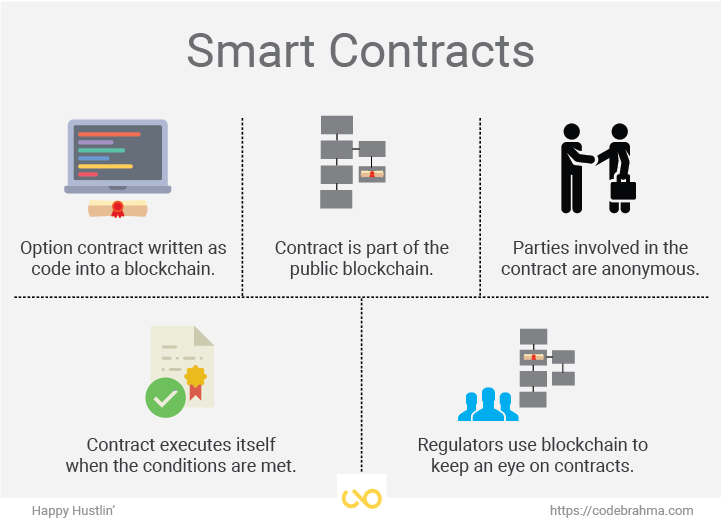 To apply logic to the way transactions are processed, they will depend on “smart contracts” – (“self-executing code on a blockchain that automatically implements the terms of an agreement between parties”)[i]. Currently, smart contracts are mature enough to handle a very basic transaction, such as cryptocurrency payment, but not yet evolved to the extent that loyalty marketers require. Let’s say you’re an airline, and you decide to collaborate with a car rental firm. In the month of June, flights booked to Hawaii will earn a 10,000-point bonus, triggered by redeeming any existing points value against your rental car. 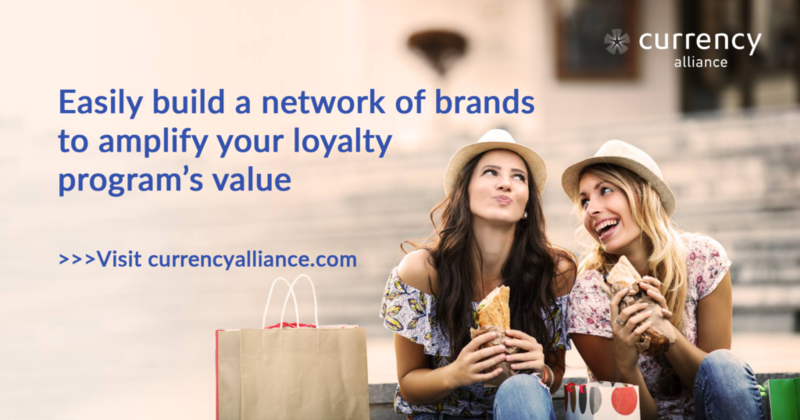 This seems like a fairly simple and standard arrangement for a loyalty marketing campaign, but no existing blockchain smart contracts have been written to handle something this complex – or even simpler transactions such as loyalty currency exchange or restrictive redemptions. If a blockchain was depended on today for even a basic loyalty program, it would be a prohibitively weak link. There are 14 jobs for every blockchain engineer, and (inexcusably, in my view) very few are coding smart contracts for loyalty. Most are focused on “asset management, or deals being made that require complex contracting” says Taso Du Val, CEO of a blockchain recruitment business[ii]. Naturally, the biggest companies with the biggest budgets have snatched the lion’s share of the talent. Blockchain-based rewards platform Loyyal ran for over a year before teaming up with IBM in order to use its Hyperledger technology[iii]. Their current offering remains well behind traditional loyalty programs in terms of application layer logic, and this collaboration only reformulates one of the major bugbears of legacy tech stacks: a dependency on expensive third-party suppliers which customize their infrastructure to the point where applications (and partners) cannot easily migrate from one system to another. As more blockchain developers enter the jobs market, some of this talent will be commissioned to create standardised loyalty rules on existing blockchains, and this will enable hybridization between legacy loyalty tech, and multipurpose distributed ledgers. But with talent in such short supply, even this hybridized waypoint to loyalty blockchains remains a few years away. People talk of blockchain transactions as if they’re free. This is a myth. Blockchains are actually notorious for consuming huge amounts of energy[iv], which means that, were a major loyalty program to overcome roadblocks 1 and 2 tomorrow, the cost of processing all their transactions on the blockchain would be prohibitive. 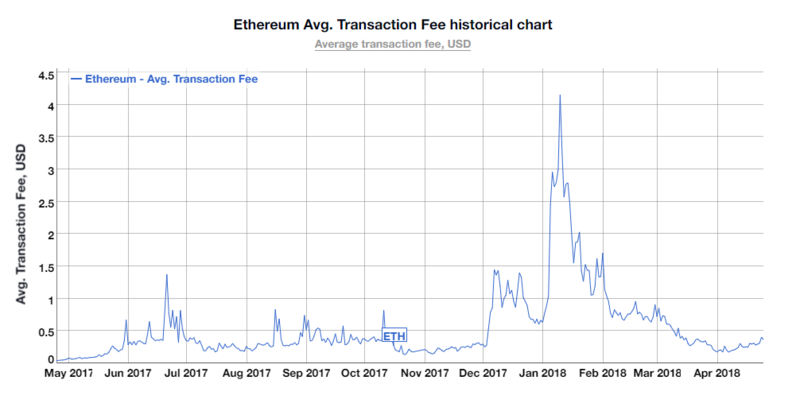 You can see from this graph how typical transaction fees in the Ethereum blockchain have fluctuated over the past year. On the ‘earn’ side, points are typically issued in ₡20-30 of value at a time. A single transaction on IBM´s HyperLedger may be in the ₡15 range. You can do your own digging and find similar transaction fees for Ethereum and Bitcoin[v]. On the ‘burn’ side, transactions closer in value to typical credit card transactions (i.e., $20-200), making the fees less of a problem; and I estimate that one day, a small consortium of brands operating the their own private blockchain could get the cost down under ₡1. But that won´t happen for several years; and since 98% transactions on the ´earn´ side of loyalty are small, blockchain costs are just too high a percentage of the value being transacted. The business model simply doesn´t work. Emerging technology undergoes significant changes in its early days; and whilst you don’t want to risk getting left behind, the loyalty business can´t really afford to be on the bleeding edge of new technology. We are still in the hype phase of blockchain – with innovations and standards evolving at a dizzying pace. Given ´hard forks´ and other infrastructure changes that take place almost weekly, if you had a blockchain solution today, you would spend most of your time just keeping it running. We simply need some time for standards to be adopted and the pace of change to settle down. One especially worrying anecdote is that of a coding error by a blockchain-based business in the venture capital space. A badly-written smart contract enabled a hacker to defraud the company to the tune of $60m. Since the vulnerability was written into the contract, some questioned whether this even constituted a crime[vi]. Such weaknesses (intentional or unintentional) will be naturally deselected as loyalty tech matures; but with hundreds of billions of dollars’ worth of loyalty currencies in circulation, loyalty programs will remain appealing to hackers and a brand cannot afford to have their loyalty currency compromised. Marketers must ensure they know what they’re driving before getting behind the wheel – or they risk major PR blunders. Fortunately, nobody has to be first to jump. With hardly any consumer brands yet having taken the blockchain plunge, there is simply nobody to do business with. One of the great advantages of blockchain is to use the network to collaborate. But if there is no one else in that environment, what is the point of being there alone. This is how I see that problem being overcome. Over 1-2 years, rapid technological advancement, spurred on by large tech firms, will finance innovation and experimentation in blockchains, some of which will trickle down to the loyalty sector. This will lead to the creation of several dedicated third-party blockchains (likely developed by a loyalty technology provider on behalf of some industry heavy-weights) which enables sufficiently complex smart contracts to be of practical use on an infrastructure mined by 8-10 loyalty program operators (keeping each other honest, but consuming a modest amount of energy). A small critical mass of the major schemes will collaborate to test the water with a minor dimension of their loyalty program. Early successes will be recorded, learnings implemented gradually, and increasing amounts of functionality shifted out of legacy systems and into the blockchain network will then attract a growing population of collaborators. All but a handful of early adopters will see 5-7 years go by before taking the plunge – and, those early adopters will wish they’d invested their capital in adding more value for customers than being on the bleeding edge of blockchain. Be excited about the potential of blockchain, but don’t get sucked into the hype. Instead, plan in the medium term of several years minimum, based on proper understanding of the technology. Customers don’t care what tech underpins your loyalty program, as long as they feel understood and recognized – and their path to meaningful rewards is not overly complicated. Realizing this fundamental truth frees you to do a great deal now to deliver greater value and freedoms to your customers. These customers are increasingly less scared of trying out the increasingly similar products and services offered by your competitors, and to tackle this problem, in 2018, loyalty professionals need concrete plans for doubling loyalty program participation. Amazon – or whoever is growing at a compound rate in your industry – has already figure out how to do this without blockchain. Faced by such a threat, you cannot afford to sit around and wait 5-10 years for rain. Good – so am I.
Blockchain is truly a transformative technology – comparable in importance to Internet Protocol [IP] networks, which took 20 years to reach a state of plug and play. In the interest of full disclosure, Currency Alliance´s platform was built in anticipation of being fully disrupted by blockchain over the next 10 years, and we will increasingly migrate functionality from our proprietary environment to one or more blockchains. This will offer our partner brands a smooth migration path to the benefits of blockchain technology, as and when it becomes safe and profitable. This will shield our participating brands from the chaos and disruption, freeing up their time now to focus on what’s most important – their customers – instead of on a network that transfers bytes.